Floyd Mayweather Jr. is widely considered the best pound-for-pound boxer in the world and to many, including himself, he is one of the greatest fighters of all time. The American has yet to lose in his 46 fights and is the most reliable man to follow in boxing betting. The next man aiming to end that unbeaten record is Marcos Maidana. This is not the first time the Argentine has stepped into the ring with Pretty Boy. The two clashed back in May of this year, a fight that Mayweather won on points after a majority decision from the judges. Maidana troubled his opponent without ever really connecting, in what was something of a lacklustre affair as the two men looked to figure each other out. This fight is expected to be a much more interesting affair, particularly now the two men have a greater understanding of each other’s styles. Mayweather, who is 1/7 with Ladbrokes Sports to win the fight, has never been put down before but was tested early in the first instalment of this contest. Should Maidana come out all guns blazing then there may be a chance he can alter that statistic. However, the undisputed champion is famed for his ability to avoid punches and it will take the performance of a lifetime from El Chino if he is to fell his rival. 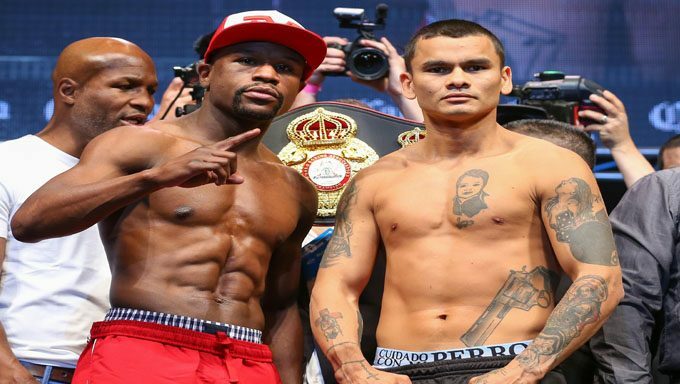 Maidana is available at 9/2 with Ladbrokes Sports to do the seemingly impossible and beat Mayweather. The former WBA champion is 35-4 from his 39 fights but has already suffered losses to the likes of Devon Alexander and Amir Khan, not stats that make great reading if you are looking to dethrone the best fighter of his generation. The fight is, unsurprisingly, at the MGM Grand, a venue that has become the 37-year-old title-holder’s home from home, with his last nine fights all taking place at the Vegas landmark, and all seeing him cruise to victory. In other words, things definitely look ominous for Maidana. However, Mayweather struggled to get his signature left jab working back in May and for the first half of the fight it appeared it may cost him. His father and trainer Floyd Sr. confirmed that his son was struggling with sore hands pre-fight, a regular problem for Mayweather, and suggested that the issue may have hindered him in the ring. No matter who wins, the match promises to be an exciting one. To wager on your winner, head to Ladbrokes Sports now.